Brexit has just begun and jobs are already leaving U.K.
Britain's future relationship with the European Union is likely to take years to negotiate, forcing companies to plan for the worst to protect their business. 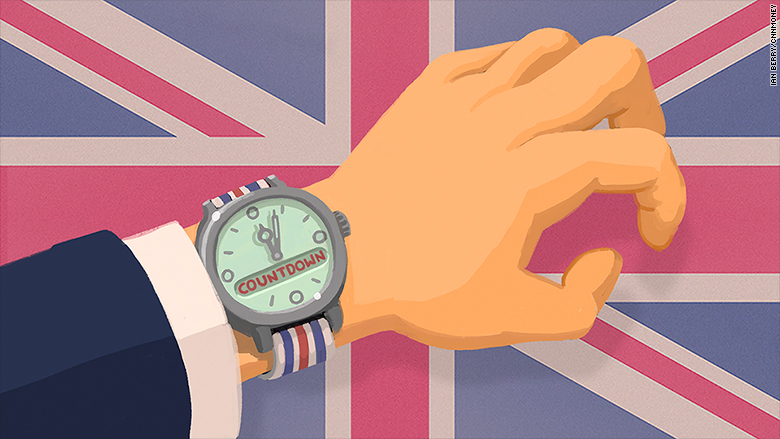 The U.K. started the two-year countdown to Brexit on Wednesday. 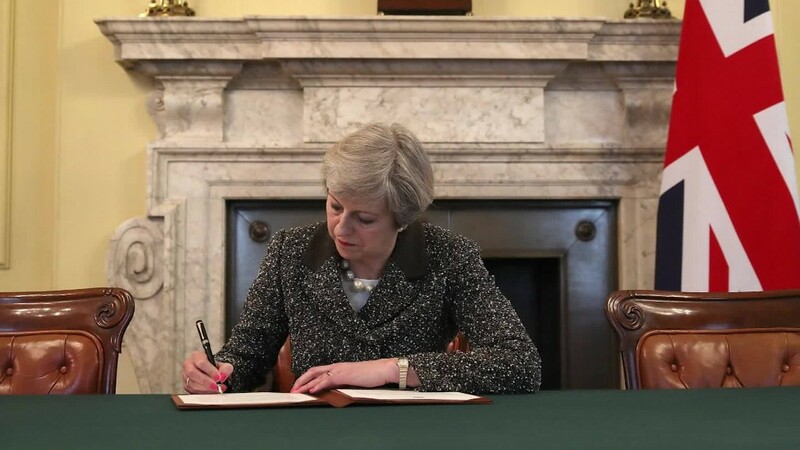 Prime Minister Theresa May wants to discuss divorce terms at the same time as negotiating an ambitious new trade deal with the U.K.'s biggest export market. But European leaders, including Germany's Angela Merkel, won't talk trade until the divorce is largely agreed. "The negotiations must first clarify how we will disentangle our interlinked relationship," said Merkel on Wednesday. "And only when this question is dealt with, can we, hopefully soon after, begin talking about our future relationship." That position was reinforced Friday when the EU released its preliminary approach to the Brexit negotiations. Preparatory discussions on a trade deal could only take place once "sufficient progress" on the divorce had been made, it said. And a deal will only be concluded when the U.K. has left the EU. That means firms in Britain -- which currently benefit from free trade in the EU -- may not know what kind of access they'll have to Europe's vast markets for at least three years. Paul Hollingsworth at Capital Economics estimates the new relationship may not be settled until 2021. Uncertainty is a business killer, and many companies can't wait that long. They're already moving to relocate some operations and jobs out of the U.K. to protect their revenues. Citigroup (C) is already figuring out how to keep its EU "passport" that allows it to offer financial services in Europe. "For planning purposes, we must assume a 'hard' Brexit in which the U.K. loses its ability to passport into the EU," wrote Citigroup's European CEO James Cowles in a memo to staff. "A hard Brexit would require certain changes, including relocating certain client-facing roles to the EU from the U.K., and the possible creation of a new broker-dealer entity within the EU." JP Morgan (JPM) said it is considering moving some staff into the EU: Dublin and Frankfurt are reportedly on its radar. HSBC (HSBC) and UBS (UBS) have warned they could each move 1,000 employees to continue serving the EU market. Insurance market Lloyd's of London isn't taking any chances, either. It confirmed Thursday that it will establish a subsidiary in Brussels, the heart of EU decision making, to ensure uninterrupted service for its European clients. Similarly, AIG (AIG) -- which has a large U.K. presence -- said earlier this month it would set up shop in Luxembourg. Auto executives are also facing key decisions on investment and production in the U.K. They may feel compelled to make new models in the EU, rather than risk facing tariffs on exports (and imported parts) after Brexit. BMW (BAMXF) is a case in point: The German automaker is considering whether to produce the new electric version of its iconic Mini car in mainland Europe rather than at its main U.K. facility in Oxford. "Much will depend on how Brexit is ultimately negotiated... We are preparing for different scenarios," said BMW CEO Harald Kruger in a recent statement. Cars made in Britain get nearly 60% of their parts from outside the U.K. -- mostly from the EU -- and 56% of those cars are sold back into the EU. Tariffs would seriously hurt the profitability of automakers' U.K. businesses. "Automakers are getting very nervous," said Justin Cox of market intelligence firm LMC Automotive. "When you put these obstacles in the way of any business, or just the uncertainty ... you see investment diverted elsewhere." Ford's (F) European CEO Jim Farley warned Wednesday that "securing tariff-free trade" with the EU was crucial. "No [trade] deal would be the very worst case for the U.K. auto industry and would put at risk the competitiveness of the industry," he said. Aviation presents its own thorny challenges. Flights to and from the U.K. are covered by an Open Skies agreement with the EU. If no replacement deal is reached on time, flights could be grounded. And the timetable is extremely tight. Airlines need an agreement by the middle of 2018 so they can plan their schedules for 2019. Low-cost carrier Ryanair (RYAAY) has pivoted its business to focus on other EU markets since the Brexit vote last June. "Britain's airlines, airports and holidaymakers need a real and early solution for aviation, or risk Britain being cut off from Europe in March 2019," warned the Dublin-based airline's top marketing officer, Kenny Jacobs. Customers could see "deep cuts to our flights both to, from and within the U.K. from March 2019," he said. Britain's EasyJet (ESYJY) said Wednesday it's applying for an EU license to secure its flying rights within the bloc. It's also preparing to tweak its ownership structure to meet rules governing carriers that offer flights from one EU country to another.